In August I wrote a case study about a very interesting Penguin recovery. A client of mine, who was hit by both Panda and Penguin during the April 2012 algorithm sandwich, finally ended up recovering from Penguin, but during a Panda update. That struck me as odd, although I wasn’t necessarily complaining. I simply had some questions for Google regarding the timing of the recovery. For example, was there a Penguin update during the Panda update? Are Panda and Penguin connected somehow? And does Penguin bubble up to Panda? I never received answers to my questions, but I was happy that my client recovered. So I moved on. Well, here we are three months later, and it happened again. I have another client that was hammered by Penguin on April 24th, losing 75% of their Google organic search traffic overnight. They contacted me in July to try and right the ship, and I started helping them in early August. 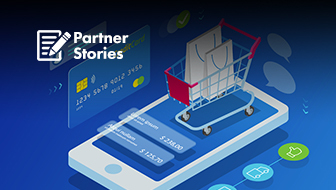 In this post, I’ll explain more about how I helped them, their progress over time, and how they eventually recovered from Penguin during a Panda update. You can see their initial drop in traffic below. On November 5th, my client recovered from Penguin. That was incredible news, but if you’re checking the dates of algorithm updates in your head right now, you’ll realize that November 5thwasn’t the latest Penguin update. It was the latest Panda update. Yes, that means my client recovered from Penguin during a Panda update (and this was the second time I had seen that happen). So once again, I had questions about the connection between Panda and Penguin. But this case study isn’t just about Penguin recoveries during Panda updates. Since the disavow tool was released in October, we were able to supplement our link removal efforts by using Google’s new tool. And I’m glad it was released. More on that soon. Below, I’m going to cover my client’s recovery story in detail. I believe there are some important points that can help webmasters who have been hit by Penguin, but who may still be struggling to recover. Also, it’s important to note that my client was nice enough to let me write this blog post documenting their situation. They definitely understand that their own experiences can help others impacted by Penguin. I’m thankful for that too. Let’s begin. 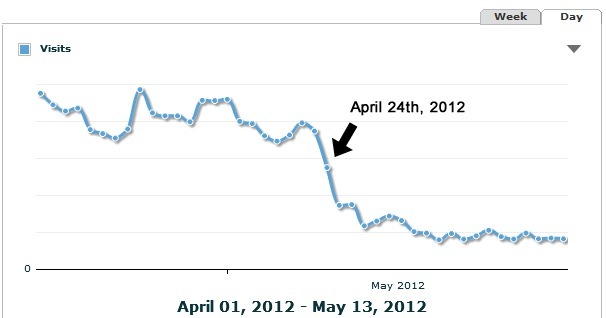 I’ve done a lot of work with websites hit by Penguin since April 24th. 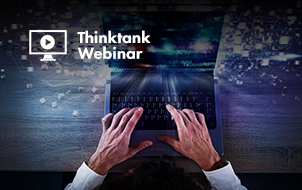 If you are interested, you can read my previous posts covering the topic, including Penguin 1.0 findings, 7 More Penguin Findings from the Over Optimization Front Lines, and Panda or Penguin, How to Know Which Algorithm Update Impacted Your Website. All three posts contain important insights, based on my analysis of 140+ websites hit by Penguin. My client’s link profile was in bad shape. 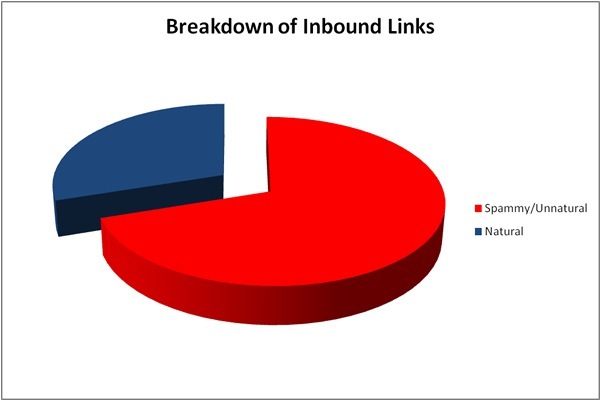 Unfortunately, some of their previous linkbuilding tactics led to a few thousand spammy links. 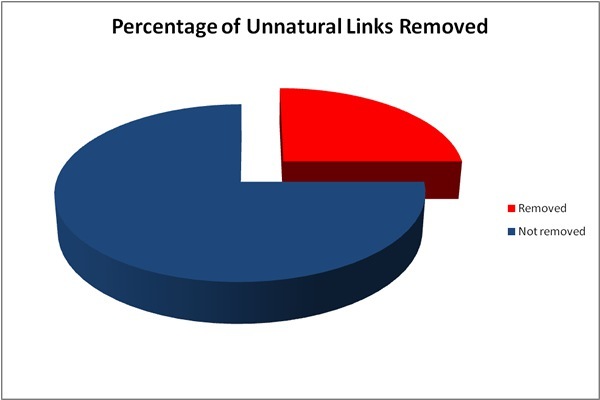 After heavily analyzing their inbound links, I realized that about 70% of their links were categorized as unnatural. In case you’re wondering, I used a number of tools to identify and analyze their links, including Open Site Explorer, Majestic SEO Tools, and of course, Google Webmaster Tools. Once the link analysis was completed, I knew that a few thousand links would need to be removed in order for my client to recover. And I also knew that the spammy links comprised a large percentage of their total links. That meant they may not have much search power when, and if, they recovered. Yes, we had a lot of work to do. It’s important to note that the disavow tool was not released at this point. I knew it was coming soon (based on Matt Cutts explaining this in early June), and I explained this to my client. Regardless, I wanted to tackle as many link removals as we could manually. In addition, we had no idea when the tool was actually coming. It could have launched within weeks, or it could have been months. We just didn’t know. I love Excel. 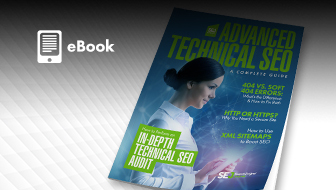 It can be an SEO’s best friend. 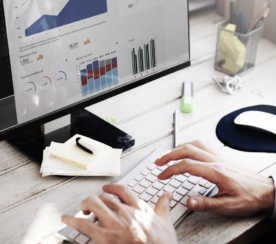 But for Penguin, you need to be prepared for Excel madness, working with many spreadsheets and worksheets, with thousands of URL’s to analyze. Yes, it can get monotonous. And that’s exactly what happened in this case. With thousands of links to check, I implemented a multi-phase approach. I wanted several sets of eyeballs on the links, including key people at my client’s company. What I might see as potentially spammy, they might see as an older and valuable link (based on knowledge of their own industry). I’m aggressive with my Penguin approach, but I don’t like collateral damage. And that’s especially the case when my client didn’t have the luxury of many quality links. I didn’t want them to lose any “good” links. Our final spreadsheets started to take form. We had links flagged for removal, links flagged as possible removals, and then links flagged as safe. All spreadsheets were sent to my client for final review. Once we had the green light from my client, we were ready to rock and roll with link removal requests. Now that our spreadsheets were ready, and spammy links flagged, I helped my client craft an email for link removal requests. By the way, I’m a firm believer that the company hit by Penguin should send the link removal requests, and not the consultant or agency. I feel it’s the proper way to go. So, my client moved fast and sent link removal requests out to many webmasters. Now we just needed to hear back from them and hopefully see some movement with link takedowns. Some webmasters responded and took the links down. Some questioned why we wanted the links taken down, and my guess is their reaction was based on receiving other requests too. And of course, some webmasters just didn’t respond at all. I was completely expecting this, but hoped we could impact a good amount of unnatural links with this first wave of requests. Phase I Results: Our initial link removal requests took down ~20-25% of the spammy links. Not bad, but not good enough. I knew we needed to have more links removed. The second phase involved tracking down any information we could about the domain owners who didn’t respond. Note, many of these domains were spammy directories, so we knew we wouldn’t track down every person in control of the websites. A modified spreadsheet was created with contact information we could find via whois data. 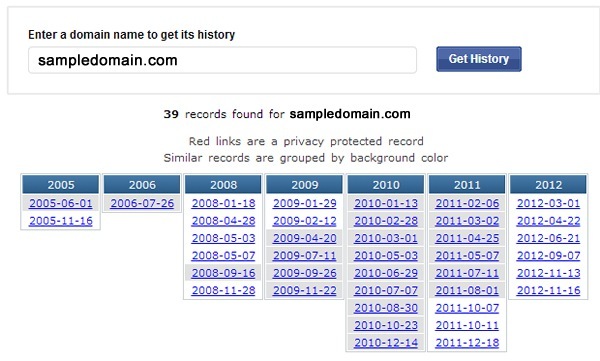 Then my client contacted those domain owners via the newly-found information. This resulted in another 10-15% of the links being taken down. At this point, we had ~40% of the spammy links removed. To me, this was progress, but still wasn’t good enough. During this process, we documented which links were removed, which domains were contacted, which ones responded, and which ones didn’t respond at all. We would need this data for the reconsideration request, which I cover next. Even when a client is hit algorithmically by Penguin, I’m a firm believer that you should get your hard work into the hands of Google employees. So, similar to what I did during the “March of the Penguins” case study I mentioned earlier, I helped my client prepare a thorough reconsideration request. 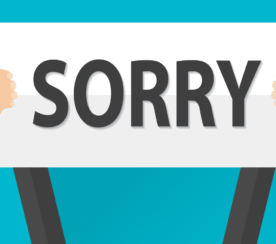 The reconsideration request fully documented how the problematic links originated, the way we identified all of the spammy links, the process we used to remove the links (including phase one and phase two), and a sincere apology that my client set up the links in the first place. 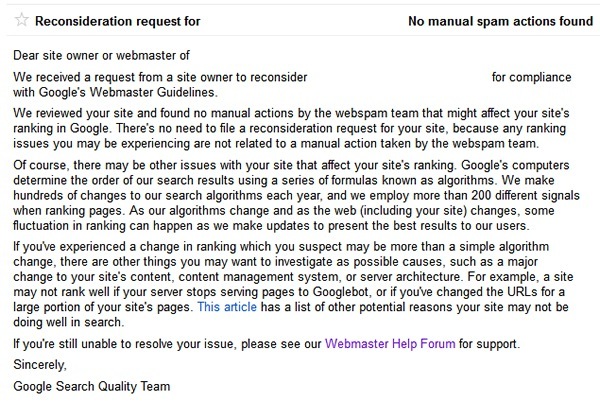 Less than a week later, we heard back from Google with the standard message, “no manual spam actions found”. I fully expected this, but again, I wanted Google to understand the work we had done, and that 40% of the spammy links were removed. So there we were. We did everything we could to remove the spammy links, but only removed 40% of them successfully. We filed the reconsideration request, which was smart, but I wasn’t sure if 40% was enough for my client to recover. We needed another Penguin update so we could see if our hard work led to success. Or so I thought we needed a Penguin update. More on that soon. When I first spoke with my client in July, I explained that Google would soon launch a disavow tool, but that the date of the launch was uncertain. It could be in a week, or it could be in a year, and that we shouldn’t wait… And as I documented above, we worked hard at manually removing spammy links. For our specific situation, the disavow tool launched at the perfect time. We had already worked our tails off manually requesting link removals, hunting down whois data, and we did remove ~40% of the links. But now we had a mechanism for disavowing the rest of the unnatural links (the ones we could not remove manually). 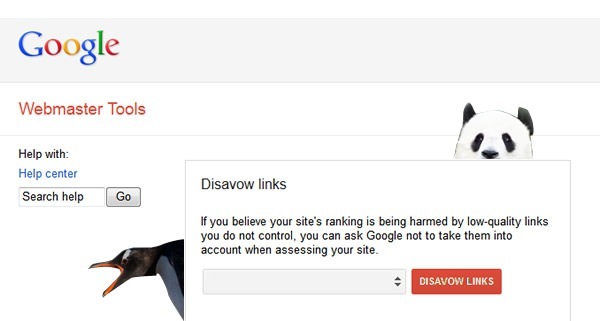 Now we were ready to rock and roll with the disavow tool. So, we crafted yet another version of a link spreadsheet, but this time focused on links we wanted to disavow. 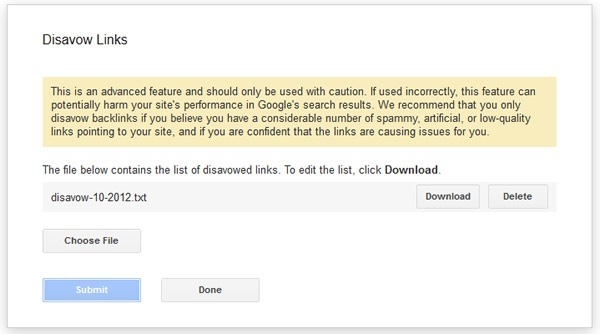 We knew we had to be extra careful with this list, since we were essentially telling Google to ignore those links, and that the URL’s and domains included in the file were categorized as “spammy” (at least to us). We didn’t want to disavow any good links, and that’s especially the case since my client didn’t have many good links to begin with. Once again, I had several sets of eyeballs on this list in order to make sure it was disavow-ready. And of course, my client gave final approval of all links included in the disavow file. After receiving final approval, I was ready to disavow the final list of links. It’s worth noting that using the disavow tool was relatively straight-forward and the process didn’t take very long. I walked through the process of uploading our disavow file, clicked submit, and the disavow process was completed. 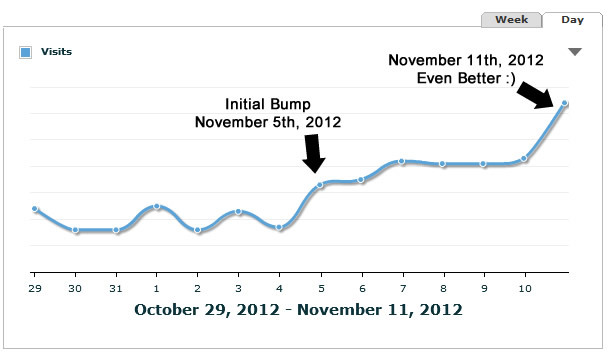 So, we submitted the disavow file on 10/26, not knowing exactly what would come next. I knew it could take a few weeks for Google to process the file and for us to see an impact, so I moved forward with other SEO projects for my client. For example, we decided to move forward with fleshing out a strong content generation strategy and linkbuilding strategy (which I knew my client would need to build more high quality content, strong links, etc.) Nobody involved was thrilled at this stage, especially since rankings and traffic hadn’t rebounded yet. But then November 5th came along. That was the day that Panda 21 launched. Needless to say, I was curious to see if Panda would help Penguin like it did for my client that recovered this summer. I quickly started analyzing my client’s analytics reporting to see if there was a change. And since Google Webmaster Tools lags a bit, I needed to wait a little longer to see the impact on impressions and clicks according to Google. When checking my client’s analytics reporting on the 5th, I noticed an interesting bump in Google organic search traffic. My client was now ranking for keywords that they weren’t ranking for on the 4th. Although I was excited, I couldn’t believe I was seeing another potential Penguin recovery during a Panda update… Now I needed to see if it was a sustained increase, or a fluke. And, I was definitely eager to see what Google Webmaster Tools would tell us impressions and click-wise. Checking my client’s analytics reporting over the next several days revealed a sustained increase from Google organic traffic. In addition, Google Webmaster Tools revealed that impressions jumped 131% and clicks jumped 113% in the days after the Panda update (11/5 through 11/12). So I had confirmation that my client had recovered from Penguin during a Panda update. I fully expected that if my client recovered, it wouldn’t be to the level they experienced prior to getting hit in April. Let’s face it, they shouldn’t have been ranking that well… The spammy links were positively impacting their organic search rankings. Now that Penguin hit, and that they had to remove a significant portion of their link profile (for the right reasons), they surely would experience less search power. And that’s exactly what happened. They are ranking much better for a wider number of keywords, but not for some money terms. 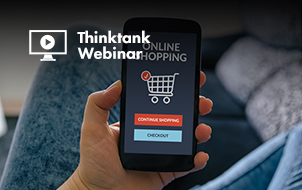 They have their SEO platform back (without a Penguin inhibiting their efforts), but simply don’t have the power they once had. So once again, a friendly Panda helped my client recover from Penguin. It’s strange, but true. And since this is the second time, I tend to think there’s a connection. I’m not sure how Panda and Penguin are tied together, but I believe they are. So, if you have been algorithmically hit by Penguin, don’t feel as if you need to wait for the next Penguin update. Two of my clients had a helping hand from Panda, and both recovered just fine. As for the disavow tool, it works. I used it, and provided a thorough list of URL’s to disavow. And ten days later, when combined with the manual link removals we performed, my client recovered. Sure, they aren’t at the levels they used to be, but they shouldn’t have been at those levels in the first place… Remember, we removed many spammy links that were helping them prior to Penguin. The process I covered in this case study was extremely tedious and frustrating at certain stages, but it worked in the end. It just takes time, the right people working on the project, the right tools at your disposal, and the right expectations.